Gameplay: The gameplay in this one is hard for me to wrap my head around. It’s a visual novel style game for sure, but the way in which the player interacts is very ambiguous. You do make choices, however, the ramifications of those choices are really not apparent, in the least. You interact with the game through your in-game cellphone, replying to text messages and emails from your friends, when you get a text, it will have a few hyper links in it (one to 3 words per each “link”). Some emails have 3 links, others have only 1, some have none, etc. But once you select a link by clicking on it, you will be shown your character’s response to the email he has just received. Often times, it’s anyone’s guess as to what he will say. (a lot of times its not very nice lol). This makes it really less about strategy and more about random chance in my opinion. 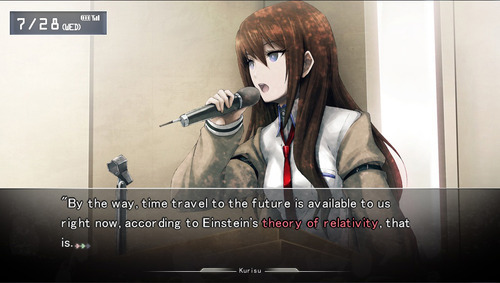 — maybe they will improve this with the official translation – or maybe it is intentionally ambiguous, just as the characters in the game are unsure of how they are changing the past,, and the consequences these actions have on their future, we as players are unsure of how our actions are shaping the future for these characters as well. But regardless, it’s a bit “different” from typical visual novels, where the choices you make are more apparent. It looks pretty awesome. Your review caught my interest. I’m going to have to look it up and try it myself.